Photo Release -- Northrop Grumman Dedicates Aircraft Integration Center of Excellence in St. Augustine, Fla.
ST. AUGUSTINE, Fla. â April 17, 2014 â Northrop Grumman Corporation (NYSE: NOC) dedicated its new Aircraft Integration Center of Excellence in St. Augustine today, which builds upon the company's 34-year legacy of operations there. Set against the backdrop of construction of a new 368,000 square foot aircraft production facility, approximately 500 employees, local business leaders, and federal, state and local elected officials gathered to celebrate the formal establishment of Northrop Grumman's St. Augustine manufacturing facility as a center of excellence. 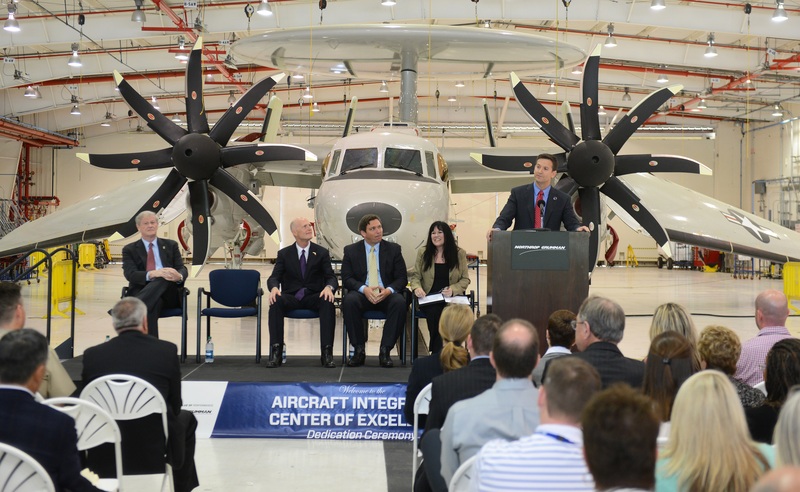 It is one of the company's two aircraft integration centers in the U.S.
Dignitaries at the ceremony included Florida Gov. Rick Scott, Florida Sen. John Thrasher and Rep. Ron DeSantis. Scott kicked off the event, which also featured remarks by Thrasher, DeSantis and Tom Vice, Northrop Grumman corporate vice president and president, Aerospace Systems. "Today's dedication signifies our continued commitment to our service men and women, to our employees in St. Augustine and to the state of Florida," said Vice. "The talented workforce at this center of excellence, coupled with a new state-of-the-art manufacturing facility, will continue to benefit our customers, our company and the community." The company recently broke ground on the new building at its campus adjacent to the Northeast Florida Regional Airport. The new building will provide additional hangar space and program management offices, which will create greater efficiency in the production flow and sustainment of aircraft. The company expects construction to be complete in early 2015. Northrop Grumman announced the creation of several centers of excellence throughout the country last year, to improve its strategic alignment with its customers' needs for increasingly innovative and affordable products, services and solutions. A leader in aviation integration and manufacturing, the St. Augustine facility has been operational since 1980. It is the home of E-2D Advanced Hawkeye production and employees have also performed work on the EA-6B Prowler, C-2A Greyhound, A-6 Intruder, F-14 Tomcat, F-5 Tiger and E-2C Hawkeye aircraft. Key aircraft manufacturing processes are managed by a team of more than 1,000 employees. With the site's designation as a center of excellence, the workforce will grow by an additional 400 employees during the next three years.